Steam-powered ferries provided a regular connection between Norfolk, Old Point Comfort, and Baltimore starting in 1817, but it was not until 1830 that ferries scheduled weekly service to the Eastern Shore. 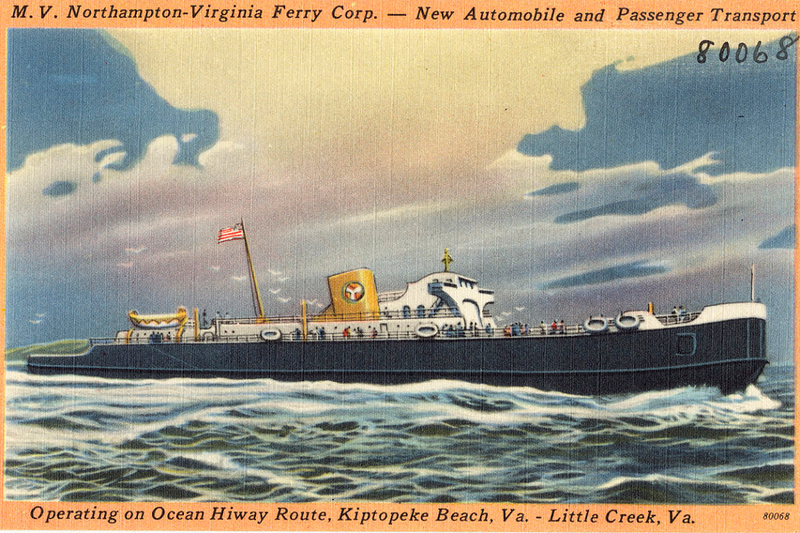 In 1884, after the Pennsylvania Railroad built a line down the Eastern Shore, daily ferry service connected Cape Charles to Norfolk and Old Point Comfort until the railroad limited its ferry service to transport of railroad cars in 1953. 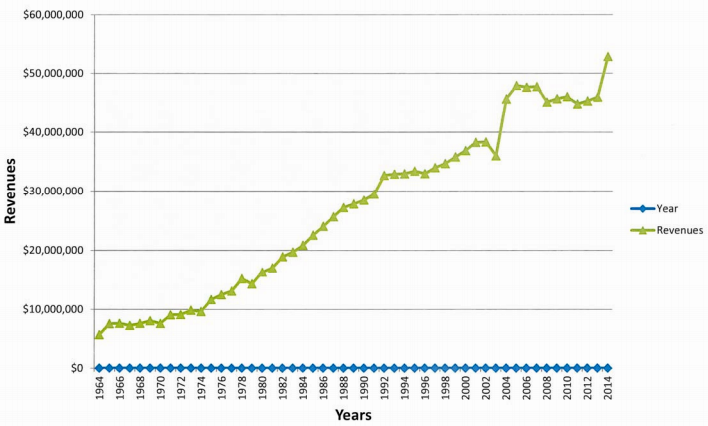 After World War II, increasing use of automobiles created a stronger demand for a faster crossing. In 1952, Maryland built its Chesapeake Bay Bridge near Annapolis to cross the Chesapeake Bay, with a four-mile span to Kent Island. In 1957, completion of the Hampton Roads Bridge-Tunnel demonstrated the potential for a bridge-tunnel combination to overcome the long distance between the Eastern Shore and Virginia Beach, without impeding ship traffic at the mouth of the Chesapeake Bay. The Virginia General Assembly created the Chesapeake Bay Ferry District in 1954. It purchased the Virginia Ferry Corporation and began operating the ferries in 1956, the same year the General Assembly authorized a bridge-tunnel facility to link the Eastern Shore to Hampton Roads. 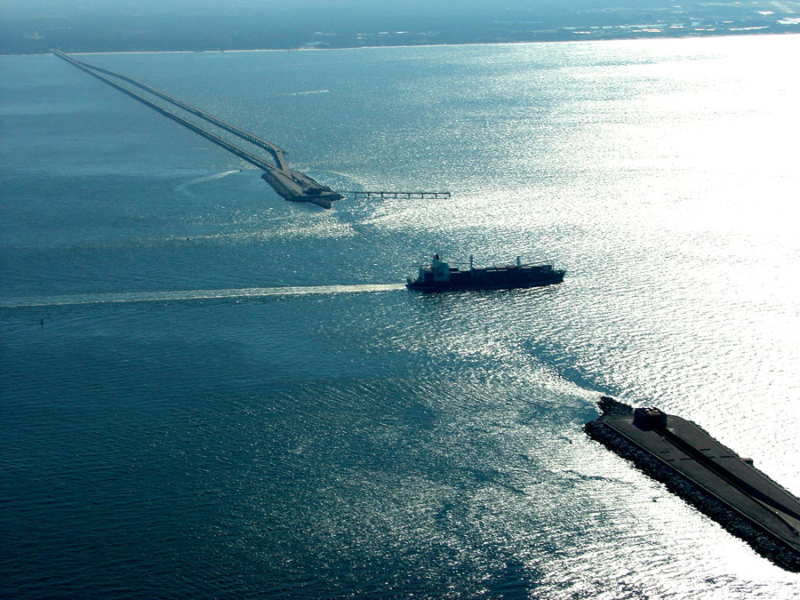 Since 1964, the Chesapeake Bay Bridge-Tunnel has carried US 13 between the Eastern Shore of Virginia and Hampton Roads. A variety of names were considered for the structure, including Virginia Capes Bridge-Tunnel and Virginia Capes Crossover. 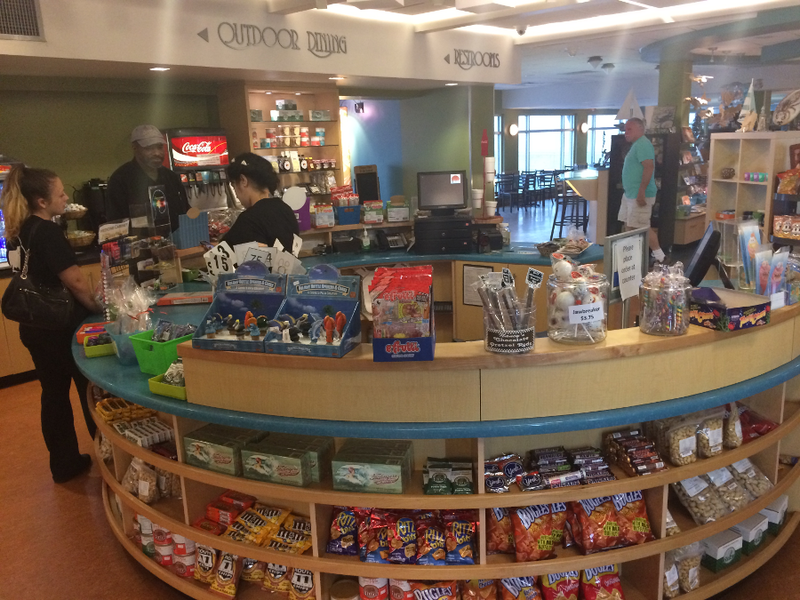 Names including "oceanway" and "seaway" were rejected out of concern that travelers might think a boat would be required. The combination of bridges and tunnels crosses 17.6 miles of water from shore to shore, enabling over 3.5 million vehicles each year to cross from Northampton County to the City of Virginia Beach. Between the toll plazas on the north and south ends, the bridge-tunnel is 20 miles long. Counting the approach roads, the facility is 23 miles long. Each of the underwater tunnels is over one mile long, and the entire project is a major engineering achievement. All of the precast concrete pilings and other materials were manufactured at the new Bayshore Concrete Products plant at Cape Charles. It was established intially for the project, and continued in business producing concrete materials for other major projects. 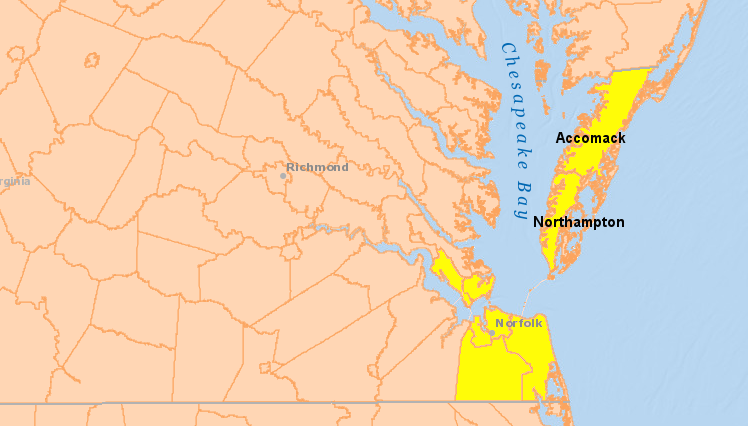 The bottom of the Chesapeake Bay is owned by the state of Virginia. 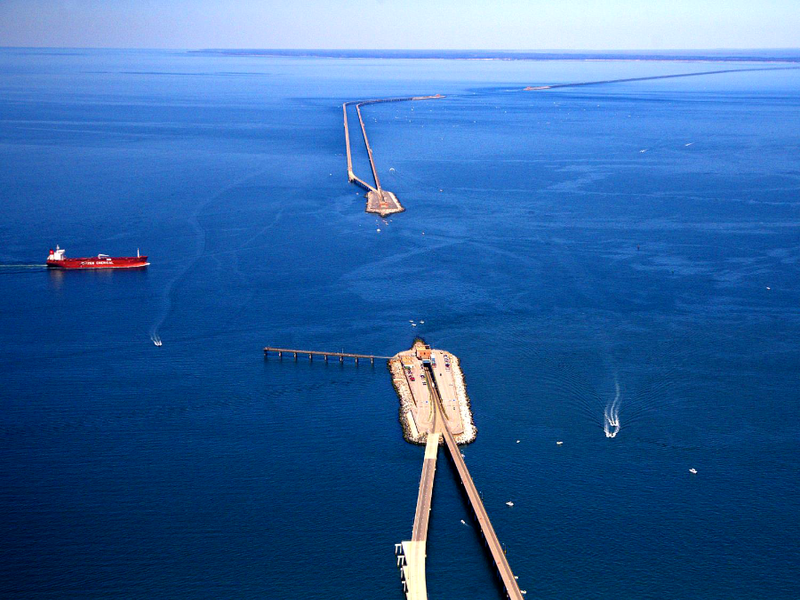 The Chesapeake Bay Bridge-Tunnel Commission had to pay the Virginia Marine Resources Commission for the use of the state-controlled submerged land. The two tunnels, each over one mile long, were essential to the project. The Thimble Shoal tunnel crosses the old channel of the James River. The US Navy relied upon that deep channel for its warships to access the Atlantic Ocean, and objected to any bridge across the channel. 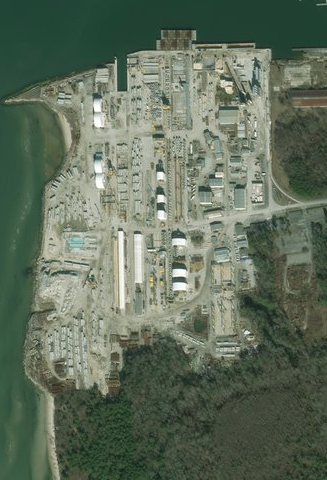 Any barrier to ship traffic in Thimble Shoal channel would seriously limit the Navy's capabilities on the East Coast. In warfare, an enemy might destroy the bridge and block the Thimble Shoal channel. That could bottle up the Navy's ships inside Chesapeake Bay and prevent ships in the Atlantic Ocean from reaching the massive naval base at Norfolk. Further north, the Chesapeake Tunnel crosses the old channel of the Susquehanna River. Funding the bridge-tunnel required the General Assembly to change its traditional approach for funding highways. The Commonwealth of Virginia had followed a "pay as you go" approach since passage of the 1932 Byrd Road Act, but starting in 1956 substantial Federal funding to construct new highways became available. 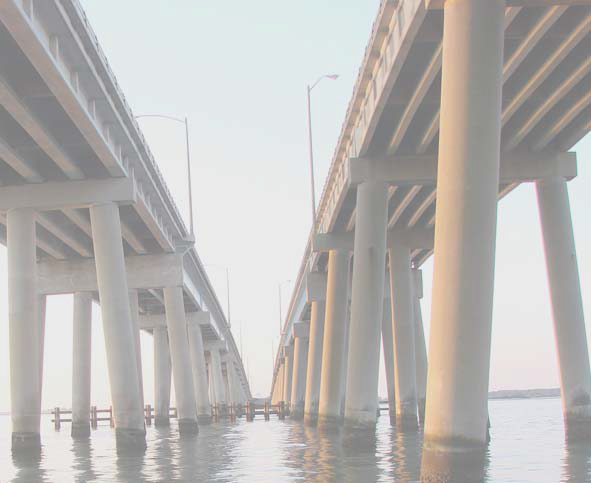 Local leaders on the Eastern Shore and in South Hampton Roads recognized that they would not obtain funding from the state or Federal sources soon, and obtained the state legislature's permission to sell bonds to finance the bridge-tunnel project. The General Assembly chartered a political subdivision (separate from cities/counties), the Chesapeake Bay Bridge and Tunnel District. 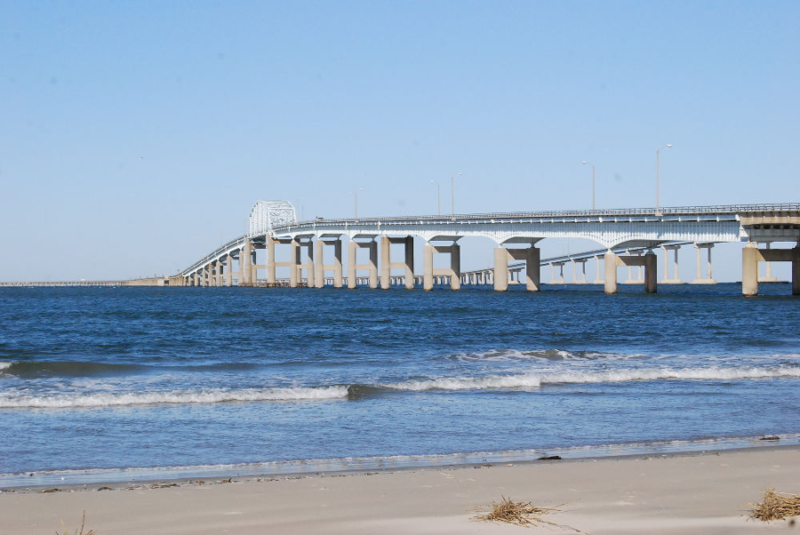 It is managed by the Chesapeake Bay Bridge and Tunnel Commission, an 11-member commission appointed by the governor to represent eight local jurisdictions and the state. 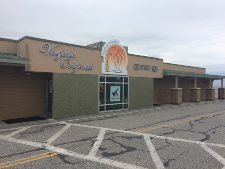 Two members are from Accomack County, two members from Northampton County, and one member each from Virginia Beach, Norfolk, Portsmouth, Chesapeake, Hampton, and Newport News. The governor also appoints one member to represent the state. The district includes two members from the Peninsula cities of Newport News and Hampton, showing how the bridge-tunnel was expected to have region-wide economic and transportation impacts. Only four of the 11 members on the commission come from the Eastern Shore counties, Accomack and Northampton. 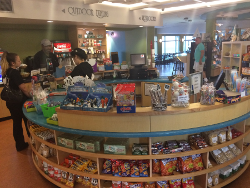 The commission was authorized to issue revenue bonds, which had to be repaid through tolls. Selling the bonds raised the initial money required to pay contractors to build and manage the new structure. Because the bonds were not backed by a guarantee of funding through local property taxes or the general revenue of the state, the "full faith and credit" of Virginia was not put at risk. No state bailout was promised if the toll revenues were inadequate to repay interest/principal to the investors who purchased the bonds. The Commonwealth of Virginia provided no construction money to build the initial bridge-tunnel or to expand it, though the state does provide urban street funding now for maintaining the transportation facility. The district's bridge and tunnel facility is monopolistic in nature, serving as the only linkage between the metropolitan Hampton Roads region and Virginia's eastern shore. Volume has been relatively stable, growing at a 0.7% compound annual growth rate (CAGR) over the last decade. However, approximately 17% of traffic is estimated to be leisure in nature, destined for Virginia Beach and the Outer Banks region, providing some concern. The initial bridge-tunnel was a two-lane highway. Capacity on the Chesapeake Bay Bridge-Tunnel is being increased through major projects every 20 or so years as old bonds are retired. According to the original 1956 enabling legislation, when all bonds have been paid the bridge-tunnel will become a toll-free road in the state highway system - which will occur 100 years after initial authorization, if current plans are fully implemented. The General Assembly approved the first phase of expansion in 1990, and parallel bridge spans were constructed in 1995-99. 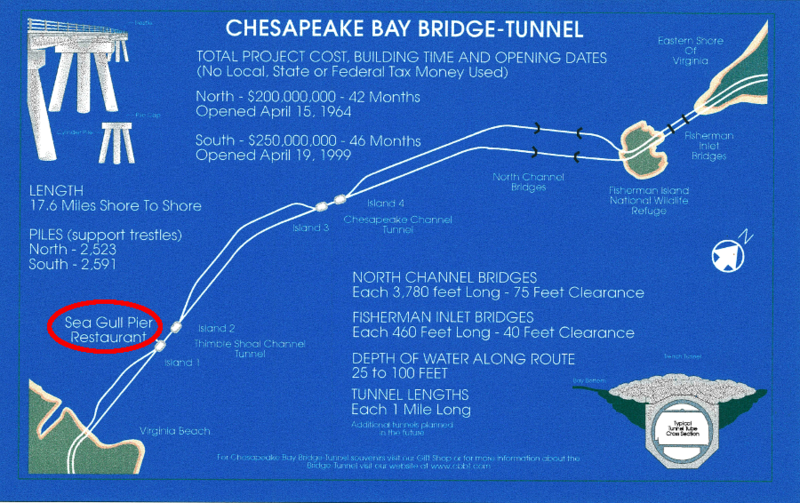 The tunnels over Thimble Shoal and Chesapeake channels were not expanded to four lanes because building parallel tunnels is far more expensive than building parallel bridges. Guard rails on the bridges are designed to stop a car/light truck from dropping into the Chesapeake Bay, so long as the vehicle hits a glancing low at not more than 62 miles/hour. Between the opening of the facility in 1964 and 2017, 15 vehicles (mostly tractor-trailers) crashed through guard rails and fell into the water. Only two drivers survived the fall, and a total of 79 people died in accidents. Separating the traffic on the bridge spans in 1999 did reduce the potential for head-on accidents. 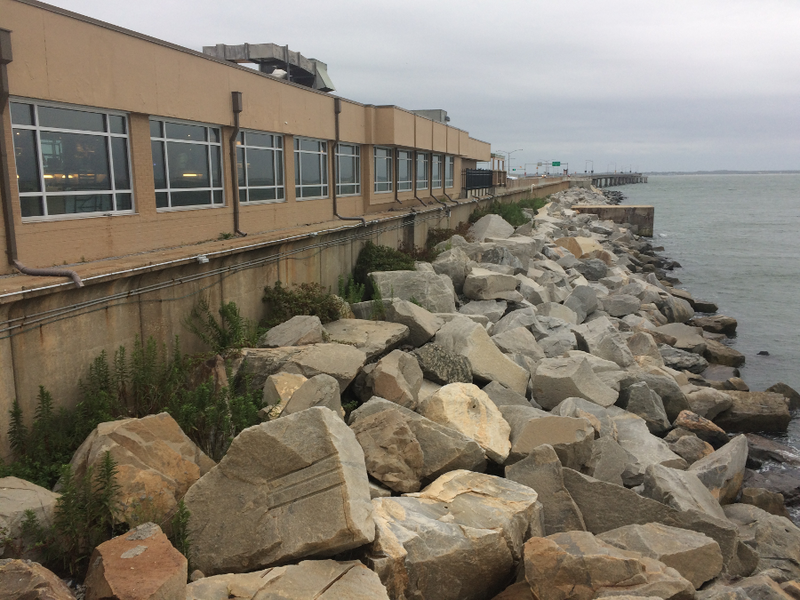 Drivers afraid to cross the facility can make arrangements for workers at the Chesapeake Bay Bridge-Tunnel to drive their vehicles. During 2015, over 400 drivers with phobias/fears took advantage of this service. The funnel between Eastern Shore and Virginia Beach can create strong winds that are a safety risk on the bridge-tunnel. There are six levels of restrictions, starting with limits on campers and towed vehicles when wind speeds reach 40 miles per hour. The bridge-tunnel is closed to all tractor trailers when speeds reach 60 miles/hour. 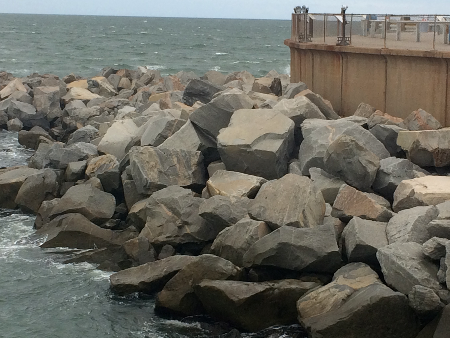 The Chesapeake Bay Bridge and Tunnel District uses different criteria than the Virginia Department of Transportation, which closes most of its bridges when sustained winds reach 45 miles per hour. About 4 million vehicles use the Chesapeake Bay Bridge-Tunnel each year, Half of them are from Virginia, and half from out-of-state. In 2014, 355,000 trucks crossed the bridge-tunnel. Truckers with empty trailers or light loads, taking US 13 to avoid congested I-95, are especially at risk when wind gusts catch them broadside. A southbound tractor trailor collided with a van in 2018 during a heavy rainstorm, then broke through the guardrail and sank into the Chesapeake Bay. The van stayed on the bridge and its occupants survived, but the crash was fatal for those in the tractor-trailer. That bridge is 17 miles of scary. 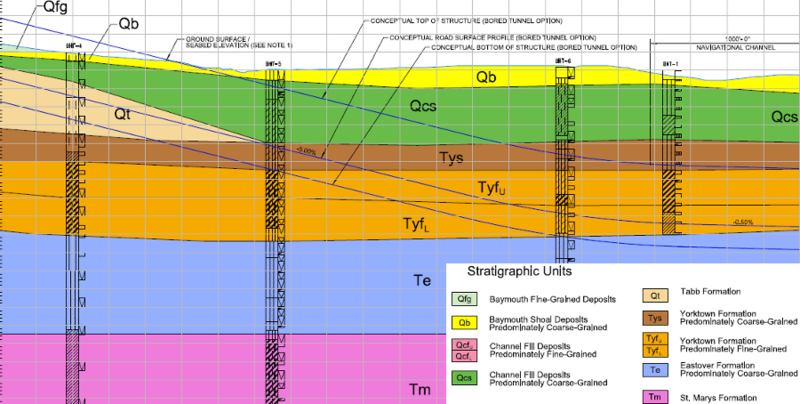 In 2013, the Chesapeake Bay Bridge and Tunnel Commission committed to the Thimble Shoal Parallel Tunnel Project. The Parallel Crossing Consortium (PC2) then submitted an unsolicited proposal under the state's Public Private Transportation Act (PPTA) for preconstruction and design services. 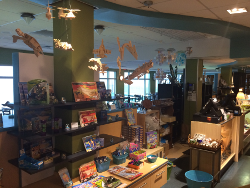 That proposal was not accepted, and the commission instead invited competitive bids for a design-build contract. All of the original price proposals exceeded the cost estimate, so the scope of the project was revised and a second round of bidding proceeded in 2016. The final award, for a cost estimate of $756 million, was $260 million lower than earlier bids. The major reduction in cost was accomplished by eliminating much of the Thimble Shoal island expansion. 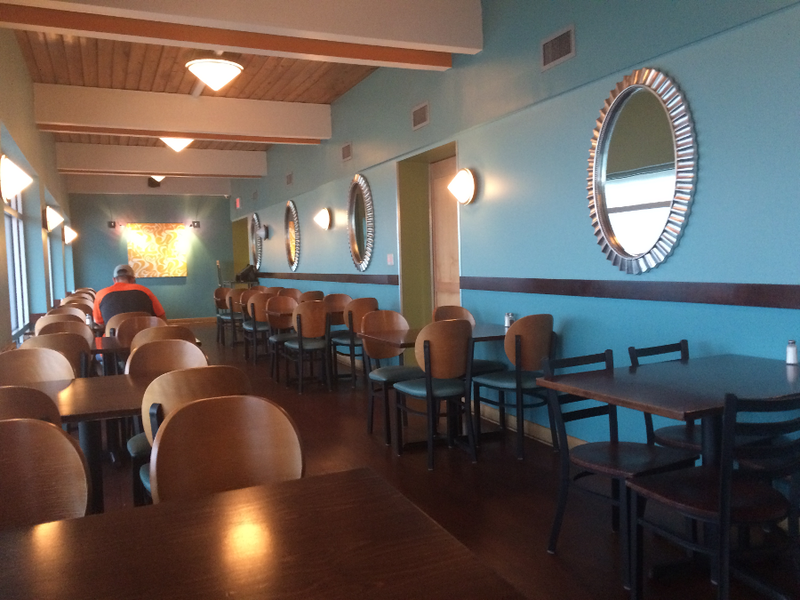 That eliminated a planned restaurant, retail shop and 200 additional parking spots. 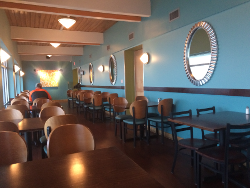 The fishing pier on the island will be re-opened, once construction is completed. The five-year construction process for the parallel tunnel at Thimble Shoal was scheduled to be completed in 2022, almost six decades after the bridge-tunnel was first opened. 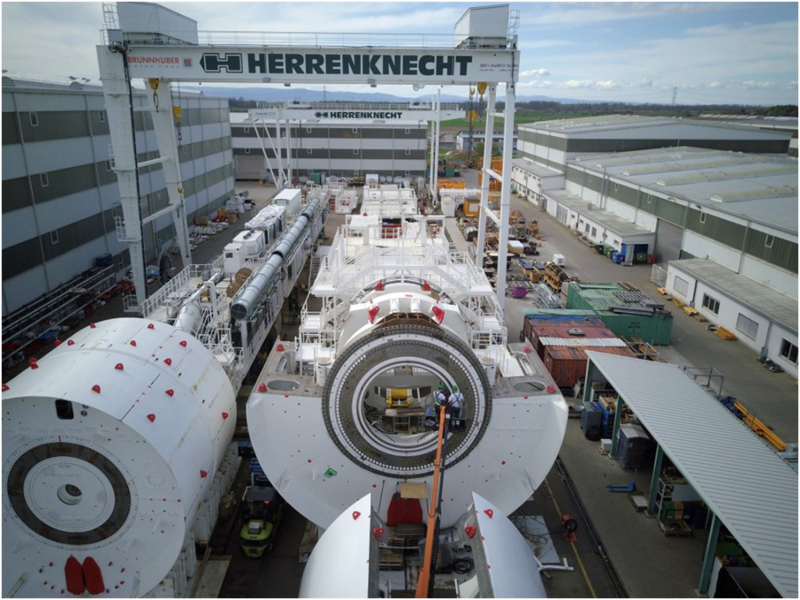 All three competitive bids were based on using a tunnel boring machine, rather than digging a trench and sinking sections of the new tube into it. 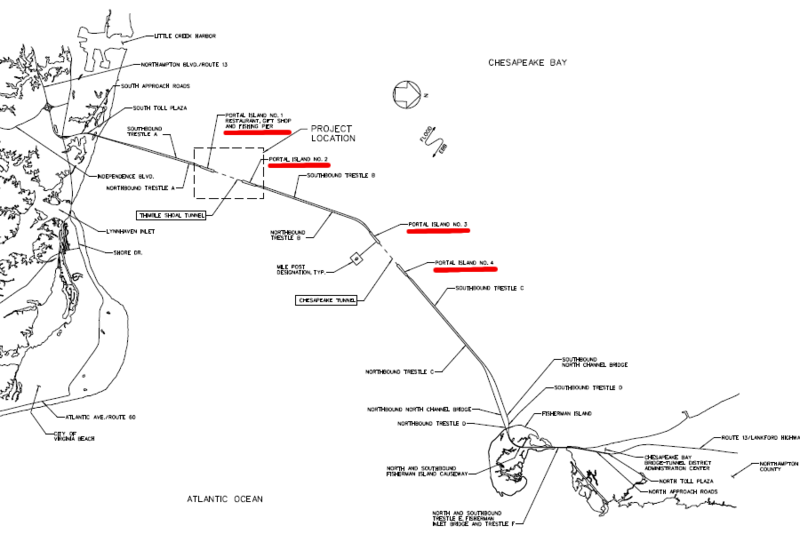 All 10 previous tunnels in Hampton Roads, including the additional Midtown Tunnel tube that was completed in 2016, had been constructed by the "cut and fill" approach. Contractors had built sections of the tunnel tube offsite, then floated those sections to the site and sunk them into a prepared trench. The tunnel boring machine was scheduled to excavate 50 feet per day. That pace required a year for the machine to excavate and install tube walls from the southern island to the northern edge of the channel. Tunnelling creates fewer environmental impacts by not disturbing the sediments on the bottom of the channel, and by not disrupting submerged wildlife migrations or shipping traffic on the surface. When the new tunnel is completed, both lanes of the existing tunnel will be used to carry northbound traffic headed to the Eastern Shore. The new tunnel at Thimble Shoal will add two more lanes, and the new tunnel will carry all southbound traffic headed to Virginia Beach. 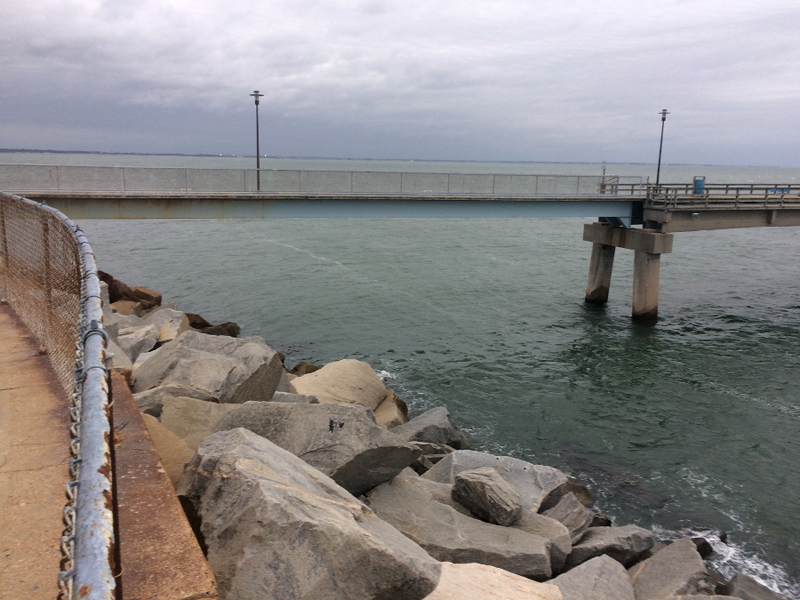 The Chesapeake Bay Bridge and Tunnel Commission did consider completely replacing the existing two-lane tunnel at Thimble Shoal. It could have bored a four-lane tunnel at a greater depth than the existing two-lane tunnel, and placed both northbound and southbound traffic in the new tunnel. Few container ships are expected to need a depth greater than 55 feet in the future, but coal exporters from Norfolk could use bigger ships that require a deeper channel. Coal is heavier than the cargo in the containers, so ships carrying coal from Norfolk and Newport News sink lower into the water and require a deeper channel. 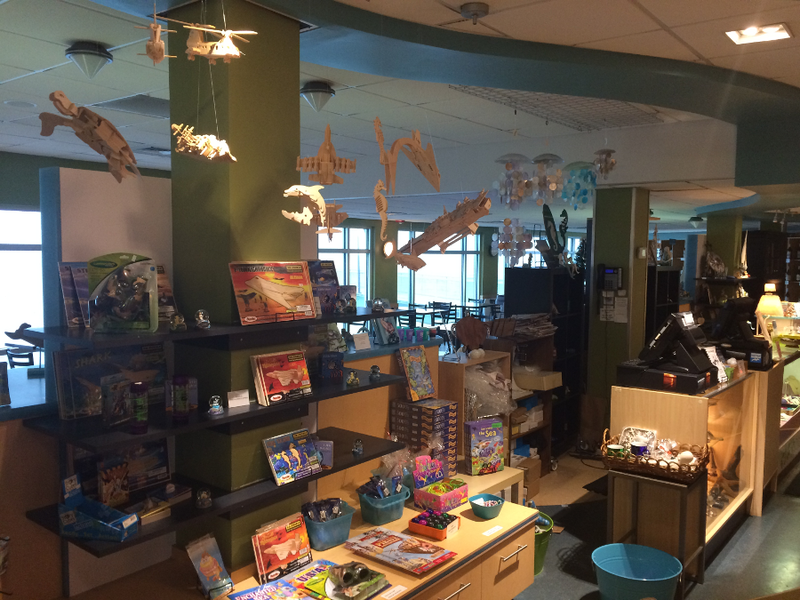 The 50-foot deep Chesapeake Channel is not used by ships carry heavy loads of coal to Europe. The most-heavily loaded ships are carrying containers, going to and from Baltimore located 175 miles further north. 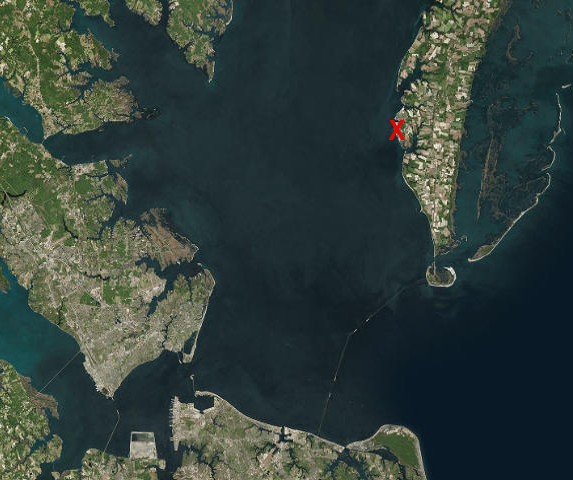 The expense of deepening the channel beyond 50' through the Chesapeake Bay to Baltimore would exceed the benefits, so there is no justificatin for the future parallel tunnel in the Chesapeake Channel to be installed any deeper than the 50" of the current tunnel. The approximate 5,700 linear feet of new tunnel will be constructed with a top of tunnel depth at least 80 feet below Mean Low Water Elevation 0.0 within the width of the 1,000-foot wide Thimble Shoal Navigation Channel and will include a minimum ten feet of riprap over the tunnel providing a minimum channel depth of 70 feet below Mean Low Water Elevation 0.0. 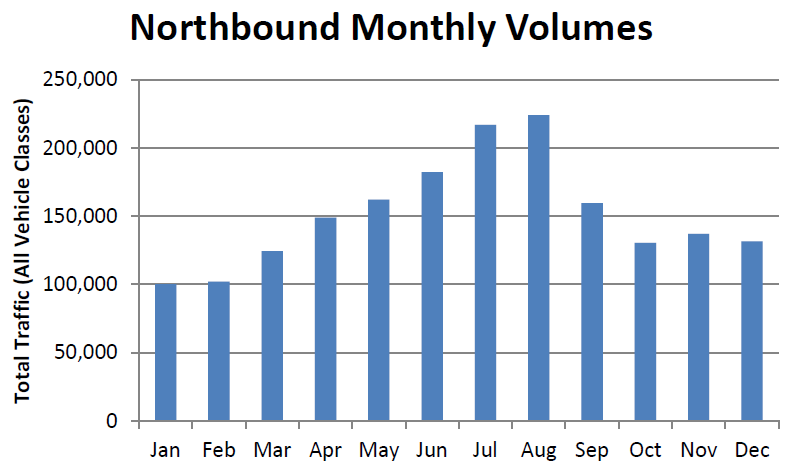 Traffic across the Chesapeake Bay Bridge-Tunnel is seasonal. The annual average is 11,000 cars per day, but in summer the demand peaks to 25,000 cars per day. Even without the new tunnels, the Chesapeake Bay Bridge-Tunnel still has greater capacity than demand during most hours. Traffic normally flows freely at the designated speed limit. There is not a commuter rush-hour traffic jam where the four-lane bridges constrict into the two-lane tunnels under the Chesapeake Channel (the old path of the Susquehanna River) and the Thimble Shoal Channel (the old path of the James River), but there are occasional delays around noon. Once volume exceeds 1,100 vehicles per hour, the merge required to pass through the two-lane tunnels causes some delay. In 2018, traffic in both directions on the Chesapeake Bay Bridge-Tunnel was limited for 17 hours, with a complete blockage for 10 hours. A truck carrying heavy equipment that exceeded the 13' 6" height limit entered the Thimble Shoals Tunnel. The equipment, an 11-ton vibrating hammer needed for construction of the Parallel Thimble Shoal Tunnel Project, struck the ceiling of the tunnel and then fell into the roadway. Adding two more lanes at Thimble Shoal will reduce merge-related delays for northbound traffic, but will not improve the flow for traffic coming south from the Eastern Shore. 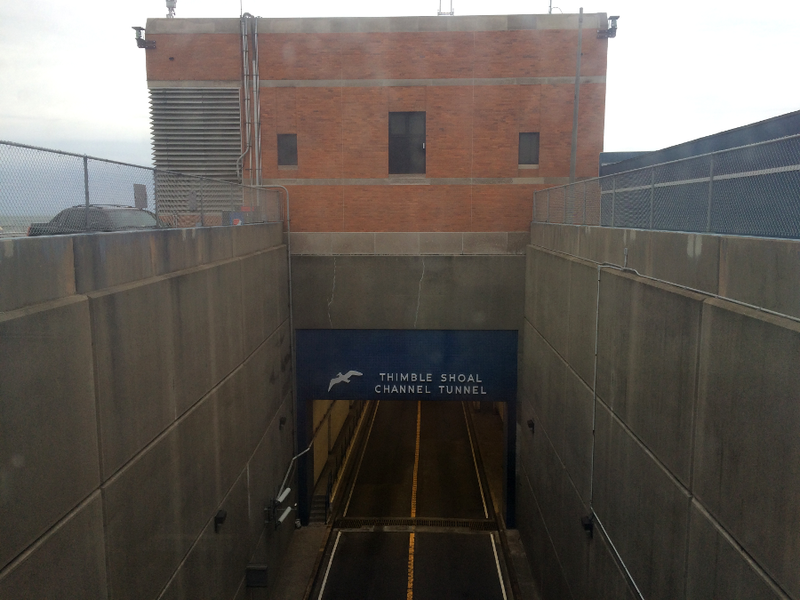 Southbound traffic must first pass through the tunnel at the Chesapeake Channel. Traffic exiting the Chesapeake Channel Tunnel and proceeding south to the Thimble Shoal Tunnel will already be constrained to 1,100 vehicles per hour. 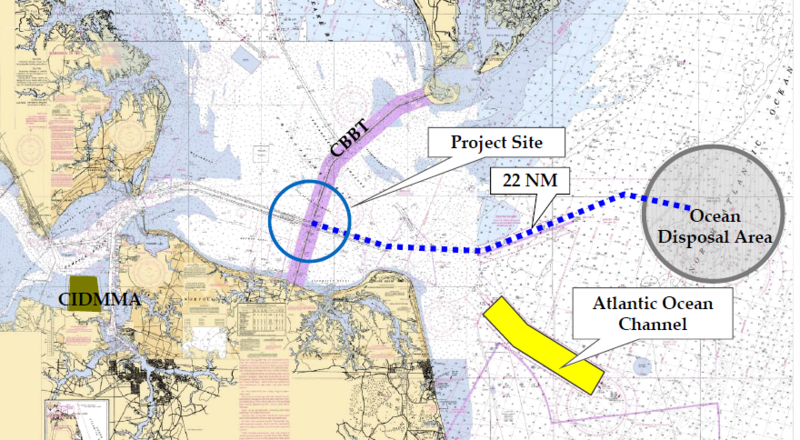 The increased capacity for southbound traffic flow at Thimble Shoal tunnel will be realized only after the second tunnel is built to cross the Chesapeake Channel. In 2012, the two-lane bottleneck at Thimble Shoal Tunnel caused a delay for less than 3% of the traffic headed northbound on the bridge-tunnel. Without a second parallel tunnel, by 2030 nearly 7% of the northbound traffic would have to slow down below the speed limit. Drivers on congested I-64 near Newport News or I-95 north of Richmond might envy expanding the capacity of a road experiencing so few delays, but upgrading those interstates could not be funded by revenue from the Chesapeake Bay Bridge-Tunnel. 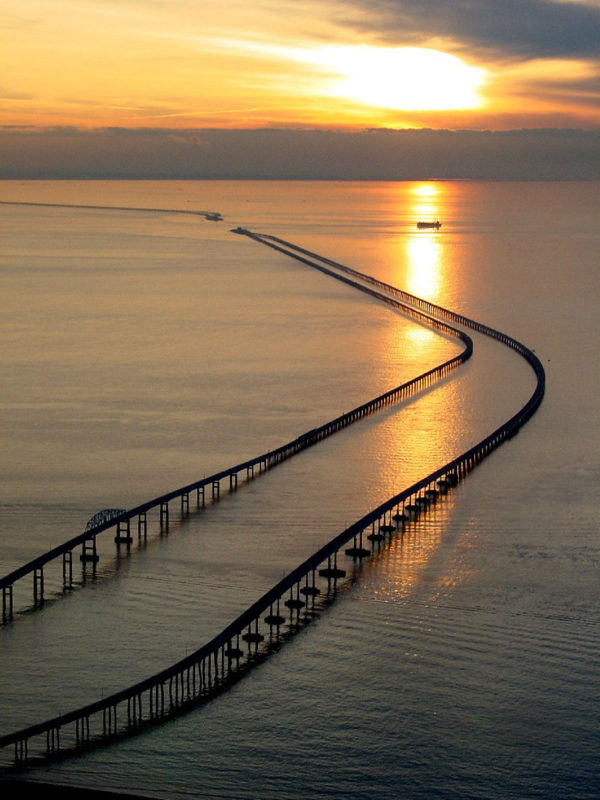 Tolls from bridge-tunnel users are dedicated to maintaining and expanding the Chesapeake Bay Bridge-Tunnel. The new tunnel project was added to the Hampton Roads 2034 Long-Range Transportation Plan and the Hampton Roads 2012-2015 Transportation Improvement Program in 2014 by the Hampton Roads Transportation Planning Organization. 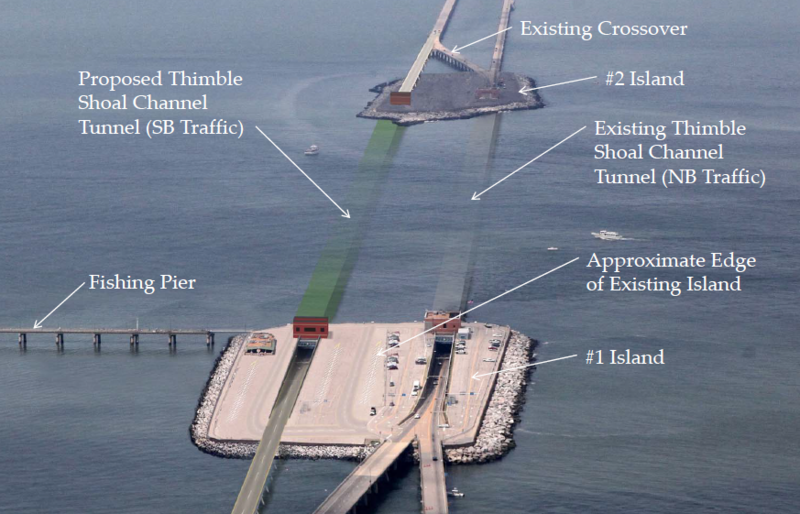 The Chesapeake Bay Bridge and Tunnel District self-finances its construction and maintenance costs using tolls paid by drivers, so building the Parallel Thimble Shoal Tunnel did not require appoval by the Commonwealth Transportation Board. The project was not ranked in the Smart Scale analysis conducted by the Virginia Department of Transportation. The new tunnel was not funded by the state's share of the gas tax or other revenues dedicated to transportation improvements in Virginia. 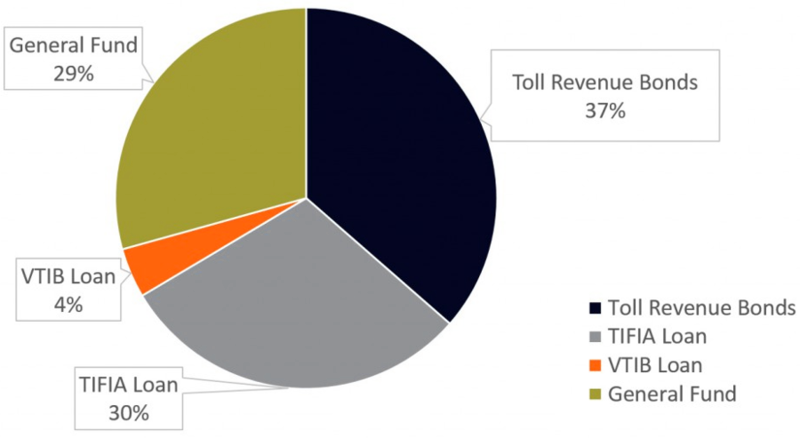 The Chesapeake Bay Bridge and Tunnel District's financial reserves were not adequate to fund the new tunnel; the district had to borrow money. 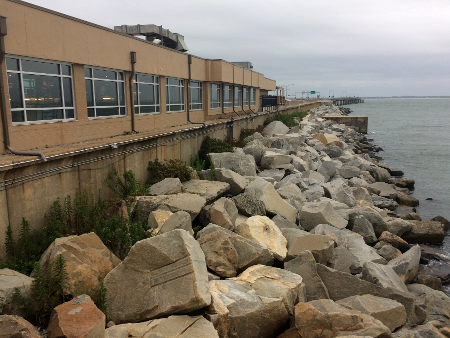 To finance construction of the new tunnel across Thimble Shoal, the district issued bonds for $756 million in 2016. 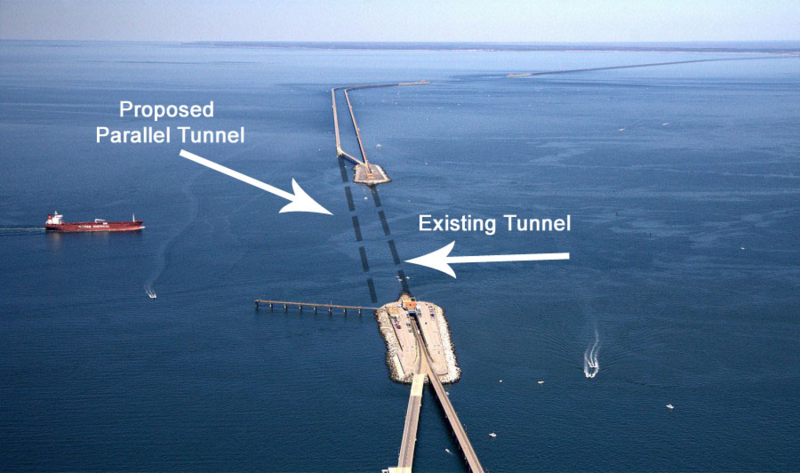 In addition to building parallel tunnels at the Chesapeake Channel, the Chesapeake Bay Bridge-Tunnel could be expanded to build a link to the Peninsula at Hampton. That theoretical construction option will remain just theory, because there is not enough traffic to justify the cost. 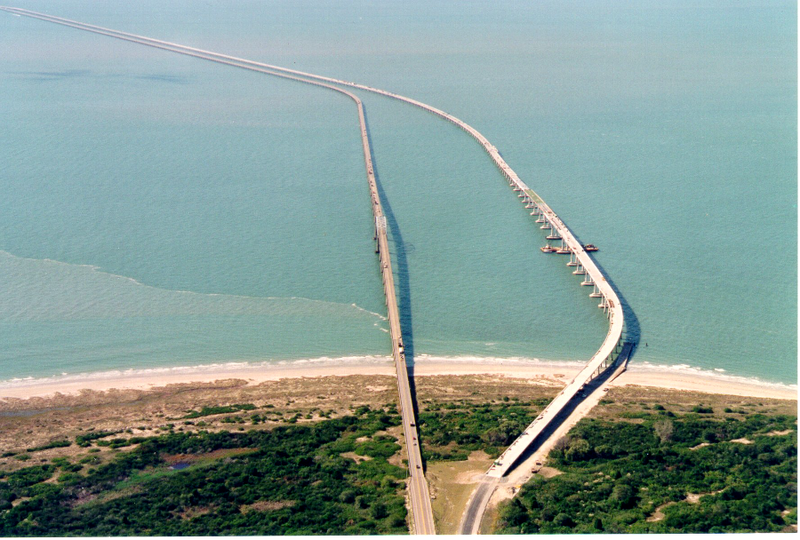 The Chesapeake Bay Bridge-Tunnel finances its construction through tolls of drivers who use the road, not through taxes on all residents in the state. An extension to the Peninsula might spur economic development on the Eastern Shore, but users of the road would bear the costs through increased tolls to finance additional construction. Increased demand for land on the Eastern Shore might provide windfall profits for property owners on the Eastern Shore, but the people receiving the benefits (landowners) would be separate from the people paying the costs (drivers paying higher tolls). 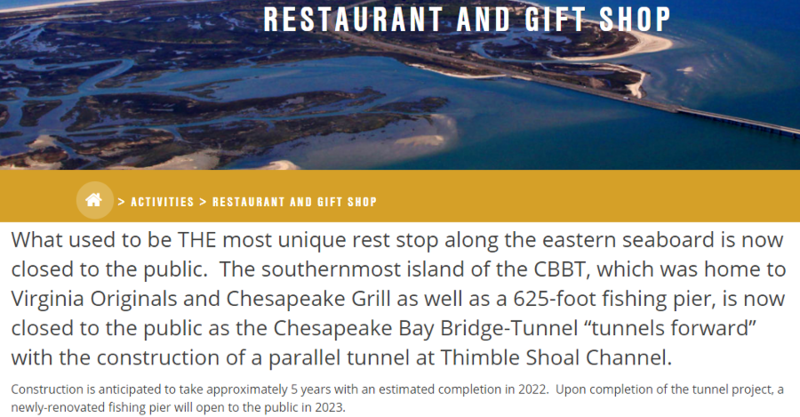 The assessment of costs vs. benefits also shaped the 2017 decision to close the Chesapeake Grill restaurant and Virginia Originals gift shop on Sea Gull Island, the southern base for the Trimbles Shoal tunnel also known as "Island One" and as "One Island in the Bay." It would have cost an additional $200 million to build space for a replacement facility as part of the parallel tunnel. It could never pay for itself. Bridge-tunnel managers have adjusted toll rates, and even created a discount prgram for local residents. 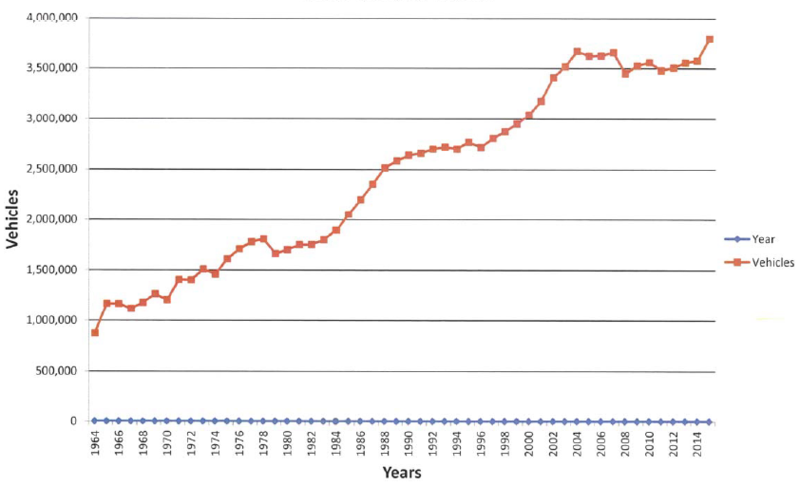 In 2001, the roundtrip price was dropped from $20 to $14 (later increased to $18) if the return trip was completed within 24 hours. Dring the May 15-September 15 "Peak Season," costs were increased for trips made on Friday thru Sunday. Would Eliminating Tolls on the Chesapeake Bay Bridge-Tunnel Help Make Northampton County Part of Hampton Roads?